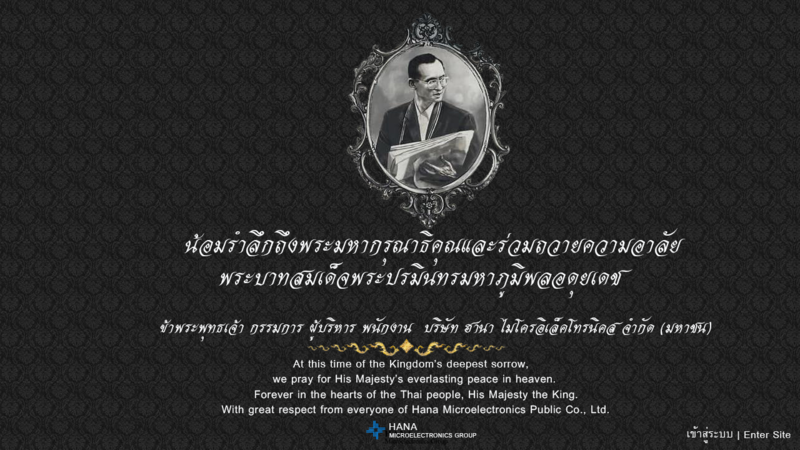 Hana Microelectronics Group 'Hana' Sales Revenue was down 7% year on year at THB 4.8 billion for the second quarter of 2016 compared to THB 5.1 billion for the second quarter of 2015. 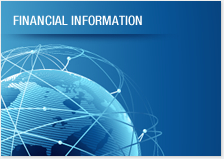 Sales Revenue in USD terms decreased by 12% to USD 135m from USD 154m in Q2 2015. Operating Profits decreased 5% to THB 374m in Q2 2016 from THB 394m in Q2 2015. Quarter 2 2016 sales revenue for the group decreased 12% year-on-year in USD terms, from USD 154m in Q215 to USD 135m in Q216. The average exchange rate for Q216 was 6% weaker at THB/USD 35.3 from THB/USD 33.3 in Q215. As a result the sales revenue in THB terms was 7% lower year on year. Year-on-year, the microelectronics divisions sales decreased by 21% in USD terms. Sales in Lamphun decreased 24% (due to a drop in high material content sales and computer products) whilst JiaXing decreased by 21%. The IC divisions USD sales revenues decreased 1% in Q216, with revenues of the IC divisions in Ayutthaya increasing by 8% and JiaXing decreasing by 23%. "HMT" the microdisplay/RFID operation in Ohio sales revenue increased 276%. equivalent the group sales were similar in Q216 compared to Q116. The average THB/USD exchange rate was 1% stronger at 35.3 in Q216 from 35.7 in Q116. The Gross Profit margin was 12% in Q216 similar to Q215 at 12% due to lower material costs (2%) offset by higher depreciation (-1%) and higher salary expenses (-1%). 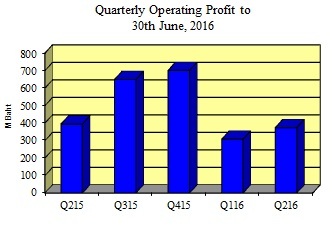 Year-on-year operating profits were 5% lower at THB 374m in Q216 compared to THB 394m in Q215. The Operating margin was 8% in Q216 similar to Q215 due to lower sales revenue (1%) offset by lower SGA costs. SG&A expenses were 3% lower in Q216 than in Q215. SG&A expenses in Q216 were 18% lower than Q116 due to the increased doubtful debts provision in Q116 reversed in Q216.